I have never cared much about Rado watches because of the lack of mechanical movements. Just recently my attention was drawn to the re-introduction of the Rado Diastar with automatic movement. 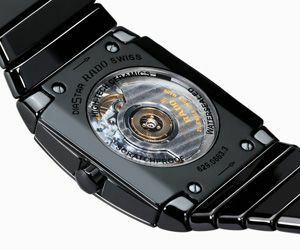 I also noted that Rado introduced their high-tech ceramic Sintra watch with an automatic movement. Well, finally :-). I¬?have to¬?admit that I like the concept of unscratchable watches by using ceramic materials, but¬?I always linked this watch to old people¬?who play tennis all day.¬?But don’t let me hold you back from purchasing¬?this Rado Sintra XXL! With the introduction of the use of mechanical movements, it might attract the younger crowd as well. As always, this ETA driven automatic Rado has a high-tech ceramic case and bracelet, a domed saphire crystal and a crystal clear dial. The movement is displayed through another saphire crystal at the back. The dial, available in black and white, features big arabic numerals. Visit the Rado website for detailed information.